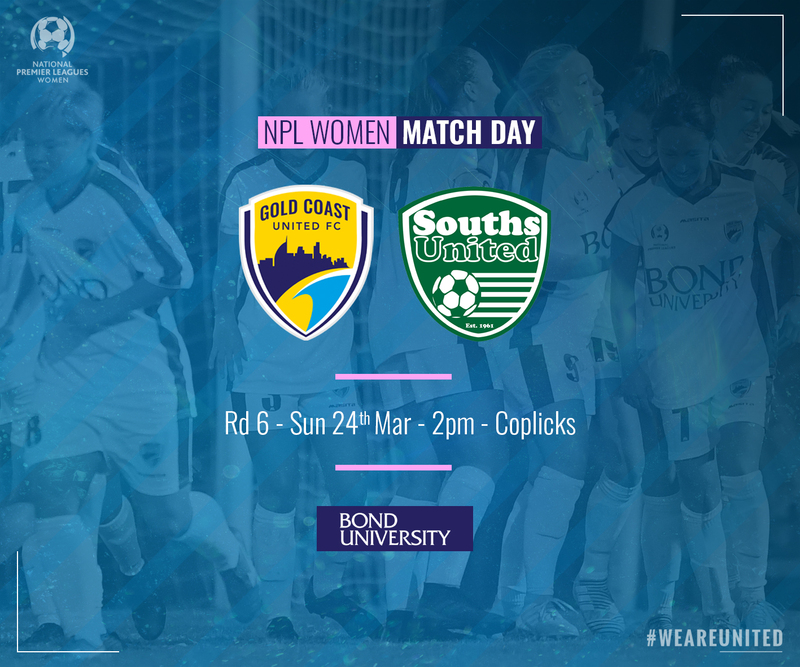 The Gold Coast United Women return to Coplicks this Sunday keen to get back to winning ways against a Souths side also eyeing off a return to the winners circle. With United’s Rd5 match against the Mustangs washed out twice, coach Michael Cook will be gearing his side up to get out of the blocks brightly against the visitors who may have heavy legs after losing their rescheduled Rd5 match unexpectedly against a rampant Capalaba on Tuesday night at home. Eloise Fryer, along with Dee Thompson, have both spent time at Wakerley Park, with Michael Cook luring the pair to United at the start of the 2018 season. Fryer’s 2018 was severely disrupted by an on-going knee complaint but after surgery and extensive rehab the defender has been steadily regaining match fitness in her four appearances in 2019. Expect a big showing from the influential defender against her former club this Sunday. The Gary French coached side bounded out of the gates in spectacular fashion in 2019, their two opening wins yielded a whopping 20 goals for and none against. But back-to-back losses to The Gap in Rd3 and the Dogs in Rd5, separated by a bye, see Souths surprisingly adrift from the front runners in sixth spot a point behind United. Amy Chapman heads the Souths scoring charts and looks the most likely among the visitors attacking selection. But there’s a host of other quality players who, if given the space and opportunity, can cause trouble for United’s defence. The opener in 2018 on the synthetic grass at Runcorn saw Souths prevail 3-0. The return fixture was also played at Wakerley Park with United triumphing 2-1. Mackenzie Akins was on the score sheet in that match, the Californian will be out to repeat that performance and add to her 2019 tally this Sunday. Kick off at Coplicks is at 2pm this Sunday. The match will be live streamed by Football Queensland for those fans who can’t make it to Tallebudgera.